A few weeks ago, I started seeing lots of aquafaba-based marshmallow fluff and meringue recipes and photos pop up on some of the vegan blogs I follow. Although I’m definitely not a baker or dessert-maker, I was curious to try making aquafaba fluff myself. (“aqua” is Latin for “water” and “faba” is Latin for “bean” hence the name.) I had a can of chickpeas, some sugar and a Kitchen Aid mixer, so I was all set. Discovered by Goose Wohlt, this technique was inspired by Jöel Roessel‘s chickpea brine experiments and has extended into the vegan community and beyond. I first tried using the fluff in an angel food cake recipe, and it failed miserably. Then I tried to make another batch but ruined it by adding in ingredients before whipping the chickpea brine. By my fourth try, I had a beautiful fluff that I decided to add some xanthan gum and coconut cream to further thicken, and it worked beautifully! You can whip it up and serve as is, or throw some blobs into a dehydrator for a more sturdy texture. They refrigerate well and taste just like a gooey marshmallow with no beany taste at all. Place the chickpea brine into a Kitchen Aid mixer. Using the whisk attachment, start on the low setting for a minute or two, then slowly increase to the highest setting for 7-10 minutes, or until the mixture is thick and frothy, and forms stiff peaks. Drizzle the sugar into the aquafaba. Wait one minute, then add in 1 tsp of the xanthan gum. Process one minute more, then add in another teaspoon of xanthan gum, whisking for 1-2 minutes more. If using the coconut cream, break up the coconut cream into small pieces and drop into the aquafaba very slowly (it will collapse if you add it in too quickly), then add the salt and process 1 minute more. The mixture should be airy and thick. Taste and add extra sugar or salt as needed. To create sturdier marshmallows, pipe or spoon 1 to 2 tablespoon-sized dollops onto a flexible, non-stick screen and place into a dehydrator. Dehydrate at 110 degrees for 8-10 hours, or until the outside has developed a texture firm enough to hold its shape. The inside should still be gooey and soft. 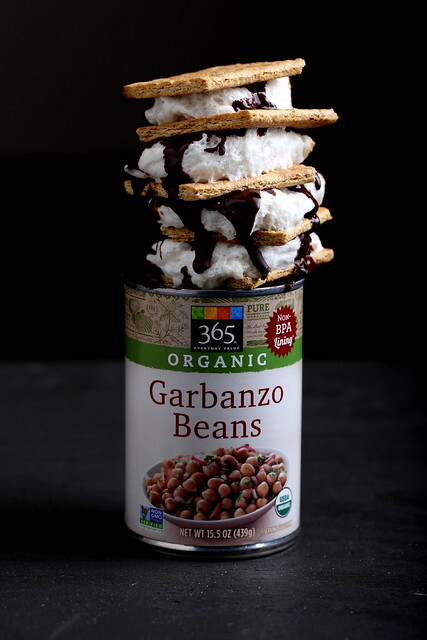 Serve with vegan graham crackers and melted chocolate. 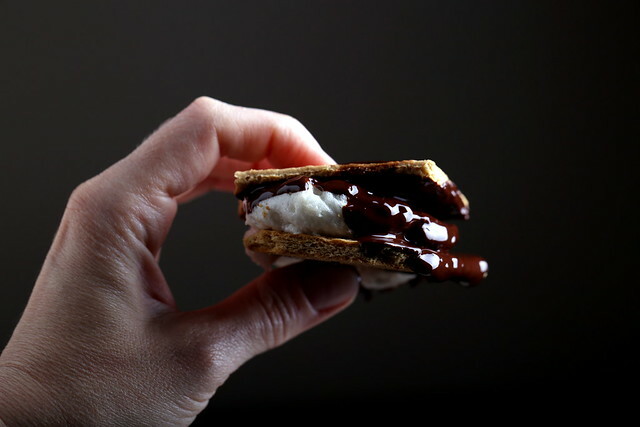 You can lightly toast the edges of the marshmallow with a butane torch or a lighter if you want. TIP: To make the mixture thicker or thinner, use a little more or little less xanthan gum. You can use straight out of the mixer as a marshmallow fluff, dehydrate for longer or shorter to obtain the desired texture. The coconut cream is optional. Refrigerate if not using right away. It holds its shape and texture well after refrigeration. For more aquafaba-based recipes, check out these blogs! We always cook dried beans (with a pressure cooker) rather than buy canned. Do you know if the recipe would work using the cooking liquid, or is there something different about the liquid in the can? Thanks for your thoughts! I suspect this works best with canned liquid, because it's thicker, but I'm not really sure. Head over to the Vegan Meringue Hits and Misses Facebook group page — there's tons of advice there, good luck! MingusTrane–I've used both canned aquafaba and cooking water (from my pressure cooker). Both work fine. Good luck! This looks great! 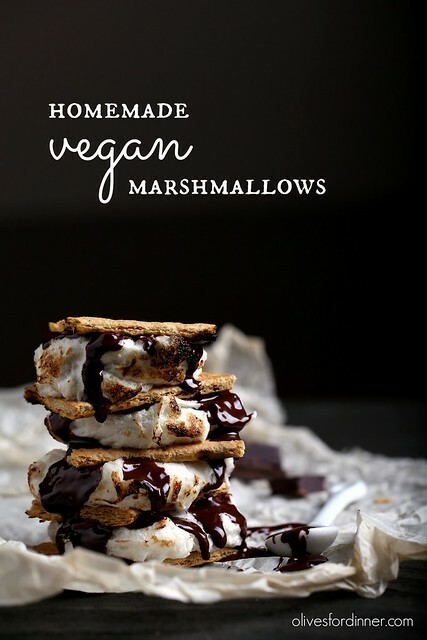 A much better alternative to store bought vegan marshmallows made with hfcs. And all with ingredients we all already have on hand! I baked some homemade graham crackers for the occasion, too! I was so excited! 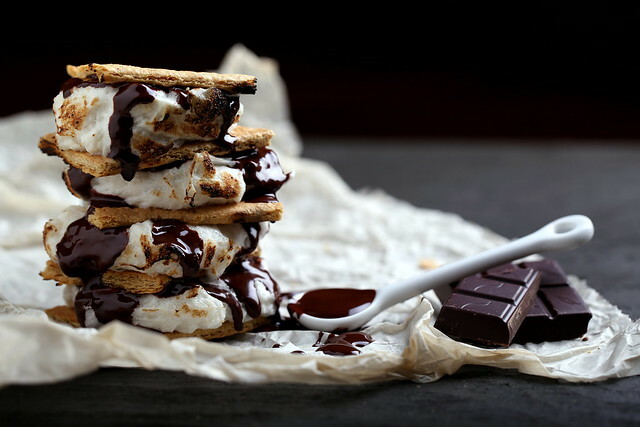 Your s'mores look amazing! OHMYGOSH I JUST REALIZED MY MISTAKE. I accidentally used agar in place of xanthan gum. My bad. At least I figured out what I did wrong! I applaud you for using a handmixer for this, that's dedication! I am not sure what happened with the coconut cream, but feel free to leave it out … it will still work without it—a little lighter and less heft, but it should still work. Not sure if the handmixing or extra moisture in the coconut cream affected it. If you haven't already, check out the Vegan Meringue Hits and Misses group on Facebook … there are some incredible tips and tricks in there. Good luck! I have to say, I had the same problem as Jenny up there, but I definitely used xanthan gum. It's too bad… I had such a wonderful consistency before the coconut cream and then it totally fell flat. Went from bright white to off white, 2L in volume to 1L. Next time I'll just stop before the coconut cream. Otherwise a great recipe and a great blog too! Kevin, not sure what happened, perhaps the fat content was to high? But yes, this still works without the coconut cream, I would just add the xantham gum in slow and wait a minute before adding in more. Because you are not adding in fat, you'll need less xanthan gum than this recipe calls for. Thanks for your kind words about the blog and good luck with your next batch of aquafaba! Yeah, I just finally got around to trying this again with xanthan gum & as soon as I added the tiniest bit of coconut cream the meringue deflated. No fun! Jenny, I've tried this twice with little impact on the fluff, so I'm not sure what happened! However, I've updated the recipe with a note to leave the coconut cream out because deflation may occur. Yes, the fruit leather trays should be fine — the mixture is sturdy enough. Good luck and I hope you enjoy! Chiming in to say that I had the deflation problem with the coconut cream, but it took a while. I was able to add maybe 2-3 tablespoons of the cream before things went south. Maybe a smaller amount is safer? Maybe the fact that I keep my coconut cream in the fridge gave me a little more leeway? I just wanted to share, I whisked these by hand tonight so my vegan daughter can have s’mores at summer camp! –No better motivation. This is so creative! I love your pictures as well! I’d love to give this a try.